Getting your Gentleman’s Guide to Love and Murder on Broadway tickets before you travel to New York is smart. It’s easy to buy your theatre tickets online, saving you time! 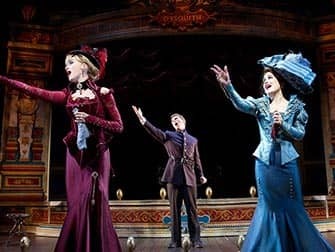 A Gentleman’s Guide to Love and Murder is a witty Broadway musical in New York. Based on the 1907 novel by Roy Horniman “The Autobiography of a Criminal”, it won 4 Tony Awards in 2014, including Best Musical. The musical tells the story of the conniving killer Monty Navarro, who tries to eliminate the eight relatives that separate him from a nobiliary title and from his true love, Sibella. 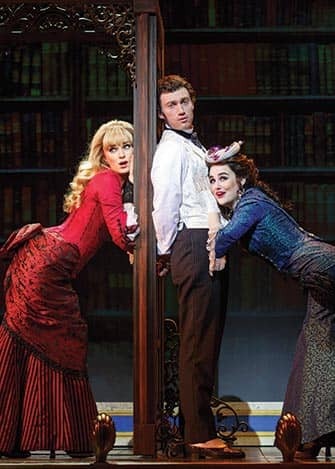 A Gentleman’s Guide can be seen at the Walter Kerr Theatre. England, 1909. The poor orphan Monty Navarro is visited by Miss Shingle, an old family friend, who brings unexpected news: Monty’s mother was a highborn “D’Ysquith”. But she was disinherited after she became pregnant and ran off with her Castilian boyfriend, Monty’s father. This means that Monty is ninth in line to inherit the earldom of Highhurst! He gets right to work to achieve the title of nobility and the heart of his beloved, the vain and beautiful Sibella, who has a predilection for men with power. However, with the appearance of Phoebe (one of Monty’s relatives, who insistently tries to marry him) some of the murders don’t go according to the plan. The eight relatives Monty should get rid of to achieve earldom are played by the same actor, who does amazingly quick costume changes and adapts to characterisation with hilarious aplomb. One after another, the D’Ysquiths (pronounced, conveniently, to sound like “dies quick”) are killed by Monty in the most absurd and clever ways. The dramatic Lady Salome, the posh Lord Bartholomew, the charity lover Lady Hyacinth, the pompous Lord Aldabert (who sings “I Don’t Understand the Poor”) … at the end of the show you simply cannot say which murder you liked best! 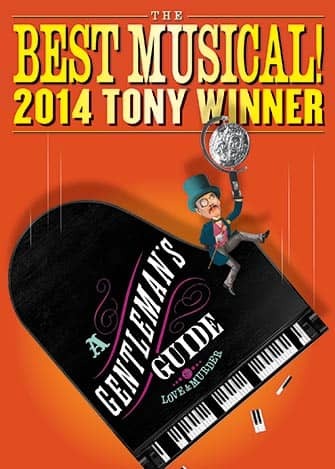 A Gentleman’s Guide to Love and Murder is a “bloody”, hilarious and an unforgettable experience. 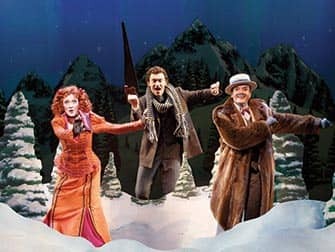 How to buy A Gentleman’s Guide to Love and Murder Tickets? It is easy to buy tickets for A Gentleman’s Guide to Love and Murder with the link below. I recommend buying tickets online before your trip to New York. Why? You will save time and money and most importantly you don’t have to stress about finding tickets when you are in New York. A lot of Broadway musicals are very popular and are often sold out. Inappropriate for 10 and under. Children under the age of 4 are not permitted in the theatre.